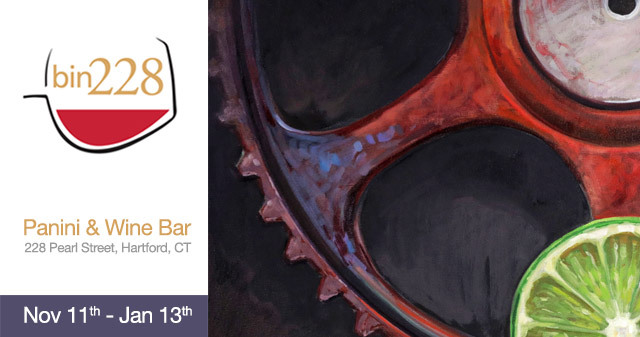 I’m very happy to have the opportunity to share paintings from the Discards & Discovery series at Bin228 Panini & Wine Bar in Hartford, CT.
November 11 – January 13. Stop by for delicious food and a great wine list — In the heart of downtown Hartford, Bin228 is conveniently located to the Hartford Stage, Theater Works, and Bushnell Memorial Theater as well as other downtown area activities and attractions. The cuisine is prepared by Bin228’s award winning chefs who take enormous pride in the preparation and presentation of each plate.